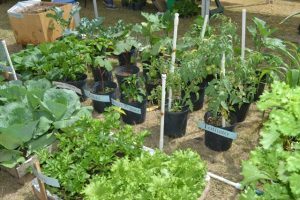 A variety of farm produce from H&H Farms is on display in Gingerland’s booth at the Department of Agriculture’s 24th Annual Open Day at the Villa Grounds in Charlestown. 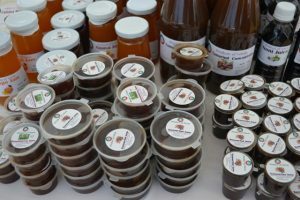 Products from the Agro Processing Unit are on display at the Department of Agriculture’s 24th Annual Open Day at the Villa Grounds in Charlestown. Randy Elliott, director at the Department of Agriculture, delivers remarks at the department’s 24th Annual Open Day at the Villa Grounds in Charlestown. Plants from the Plant Propagation Unit on display at the Department of Agriculture’s 24th Annual Open Day at the Villa Grounds in Charlestown. 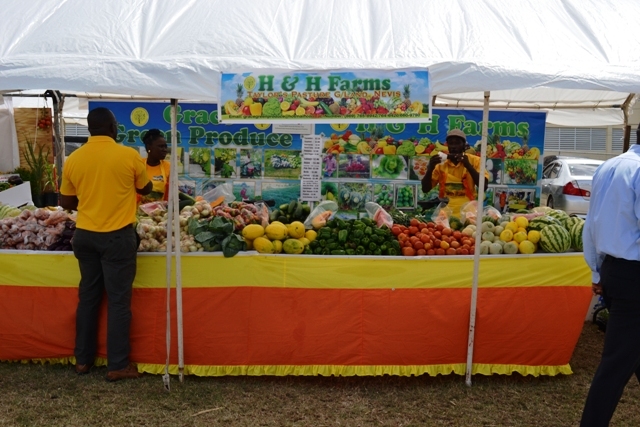 CHARLESTOWN, Nevis – The Department of Agriculture is making strides in every sector of agriculture in its continued quest for the island’s food security. The department’s achievements in 2017 were revealed by Director Randy Elliott at the opening ceremony for its recently held 24th Annual Open Day at the Villa Grounds in Charlestown. Elliott added that there has also been an increase in the commodities exported through the Plant Quarantine Unit and there are no new invasive pests introduced as the department continues to protect the island’s boarders. He said the Plant Propagation Unit continues to play its role providing healthy seedlings and fruit trees to farmers and the public. As a result, they have realised an 18 percent increase in output. The Agro Processing Unit has also registered an increase in its output of 25 percent. The department’s director commended the creativity demonstrated by staff members and former permanent secretaries and directors. He said the department’s achievements came in spite of the challenges faced in 2017, notably the passage of hurricanes Irma and Maria, which adversely affected farmers. 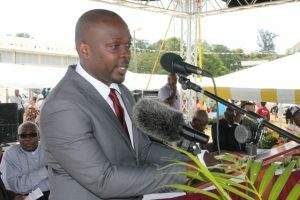 However, with the assistance of the partnerships forged with allied agencies and friendly governments, including the Republic of China (Taiwan), Inter-American Institute for Cooperation on Agriculture (IICA), Caribbean Agricultural Research & Development Institute (CARDI), TDC, Tropical Blossoms and the department’s staff, they were able to pull through with crop production. Elliott underscored the department’s commitment to improving the island’s food security through farmers to provide affordable and healthy food for the people of Nevis. He urged consumers to continue to support the farmers and to buy and consume local produce. Apart from crop production, the department has seen success in dealing with the island’s monkey population. Through the ANOVA project, 17 acres of farm lands owned by 12 farmers has been protected with the installation of electric fencing. The department has also begun developing forage banks for livestock farmers, improving animal surveillance and introducing new cattle breeds. Two costal development projects have also been introduced through the Global Environmental Fund (GEF) and the Nevis Historical and Conservation Society (NHCS). At New River, a 10-acre block has been reserved for coconut development, while five acres of land has been set aside at Prospect for the establishment of an arboretum. The department has remodelled the Plant Propagation Unit’s shade house; reopened the Animal Pound; constructed green houses for schools; held educational workshops for farmers, in collaboration with allied partners, including the Food and Agriculture Organisation (FAO), on a variety of topics about money management; and they have set up a semi-commercial aquaponics farm at Prospect.